Emerging antibiotic-resistant bacteria represent a major healthcare concern that has been predicted to become a leading cause of death in our society in the coming decades. Alternative strategies for treating drug-resistant infections are being developed, but most have a finite window of efficacy because sooner or later bacteria develop resistance1–3. Antimicrobial peptides (AMPs), innate to virtually all living organisms4, are promising alternatives to conventional antibiotics because their modes of action are diverse. Recent advances have been made to reprogram these molecules to increase their stability and selectivity3. Improved AMPs can also be generated and evolved in silico5, by using genetic algorithms6,7 that harness information about their physicochemical features to redesign these agents8, making them highly potent and stable5. Ultimately, we seek to build a database with comprehensive biological information about this class of molecules. However, constructing such a database will require standardizing the systematic approaches required for evaluating AMP biological function. 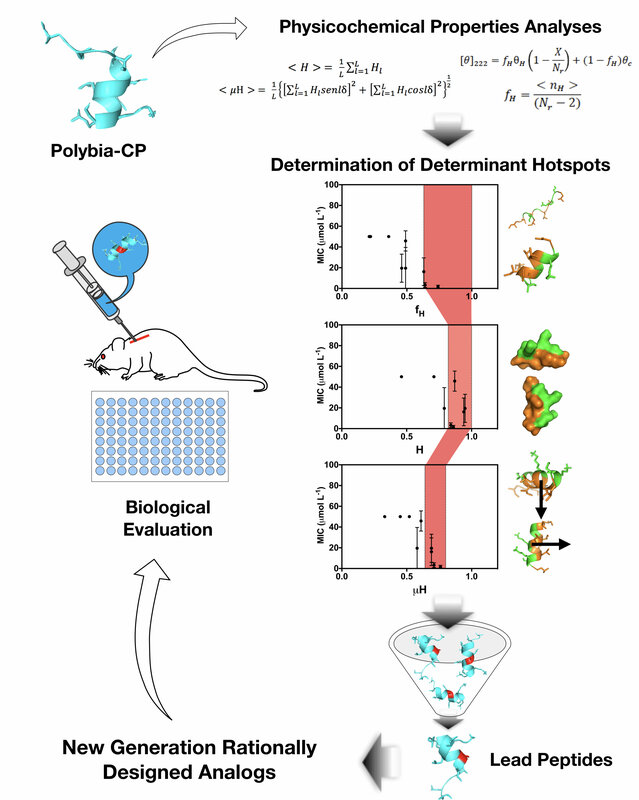 As a step in this direction and as proof-of-concept, we performed in the present study a structure-function-guided exploration of Polybia-CP, a small cationic amphipathic peptide, to identify the most relevant activity determinants that could be manipulated to precisely tune biological activities such as toxicity and antimicrobial function. Polybia-CP is a 12-amino acid antimicrobial and chemotactic peptide derived from the venom of the wasp Polybia paulista, which is highly toxic towards mammalian cells and thus could not previously be used as an antimicrobial drug9. Systematic mutation of the native sequence of Polybia-CP yielded insights into the influence of individual residues on the physicochemical determinants of toxicity and antimicrobial activities. We found that hydrophobicity, helical tendency, and net positive charge played an important role. 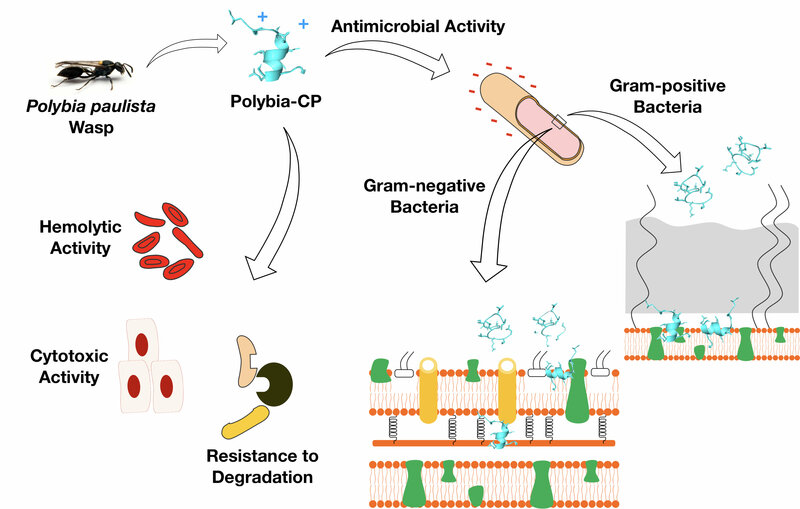 A second-generation set of peptides further confirmed that the antimicrobial activity of Polybia-CP and its synthetic derivatives correlated with an increase in net positive charge at strategic positions of the sequence, which led to increased helical content. Such insights may be used to reprogram other AMPs to precisely modulate their antimicrobial and cytotoxic activities10. The results obtained in this work may be expanded to other AMPs present in the biological world11–14. We anticipate that this field will be accelerated by incorporating computational approaches such as molecular dynamics, artificial intelligence (e.g., genetic algorithms, machine learning) for the extraction of principles for optimizing physicochemical feature-activity relationships. These efforts may lead to elucidating precise physicochemical rules governing AMP biological function and thus to develop therapeutic agents to help combat antibiotic resistance. 1. de la Fuente-Nunez, C., Torres, M. D., Mojica, F. J. & Lu, T. K. Next-generation precision antimicrobials: towards personalized treatment of infectious diseases. Current Opinion in Microbiology 37, 95–102 (2017). 2. de la Fuente-Núñez, C., Reffuveille, F., Fernández, L. & Hancock, R. E. W. Bacterial biofilm development as a multicellular adaptation: antibiotic resistance and new therapeutic strategies. Curr. Opin. Microbiol. 16, 580–589 (2013). 3. Lázár, V. et al. Antibiotic-resistant bacteria show widespread collateral sensitivity to antimicrobial peptides. Nat. Microbiol. 3, 718–731 (2018). 4. Zasloff, M. Antimicrobial peptides of multicellular organisms. Nature 415, 389–395 (2002). 5. Porto, W. F. et al. In silico optimization of a guava antimicrobial peptide enables combinatorial exploration for peptide design. Nat. Commun. 9, 1490 (2018). 7. Pane, K. et al. Identification of Novel Cryptic Multifunctional Antimicrobial Peptides from the Human Stomach Enabled by a Computational–Experimental Platform. ACS Synth. Biol. 7, 2105–2115 (2018). 9. Souza, B. M. et al. Structural and functional characterization of two novel peptide toxins isolated from the venom of the social wasp Polybia paulista. Peptides 26, 2157–2164 (2005). 10. Torres, M. D. T. et al. Structure-function-guided exploration of the antimicrobial peptide polybia-CP identifies activity determinants and generates synthetic therapeutic candidates. Commun. Biol. 1, 221 (2018). 11. Pedron, C. N. et al. Novel designed VmCT1 analogs with increased antimicrobial activity. Eur. J. Med. Chem. 126, 456–463 (2017). 12. Torres, M. D. T. et al. Antimicrobial activity of leucine-substituted decoralin analogs with lower hemolytic activity. J. Pept. Sci. 23, 818–823 (2017). 13. Torres, M. D. T. et al. Peptide Design Enables Reengineering of an Inactive Wasp Venom Peptide into Synthetic Antiplasmodial Agents. ChemistrySelect 3, 5859–5863 (2018). 14. Torres, M. D. T. et al. Decoralin Analogs with Increased Resistance to Degradation and Lower Hemolytic Activity. ChemistrySelect 2, 18–23 (2017).